One of the most frequent questions we get asked by people who are on one of our beginners courses is "which bow should I buy?". This though is perhaps the wrong question to ask and instead it should be "when should I buy my first bow?" Whilst it is perfectly understandable to be excited about your new sport, it would be a mistake to rush out and buy a bow too early as this can result in having to replace parts earlier than you would otherwise need and/or buying something that may either cause you injury or impair your development and enjoyment of the sport. For this reason we strongly suggest that our members make use of the clubs bow loan scheme. For a deposit of £50 we will loan you one of our beginners bows, a sight, tab, arm guard and a set of arrows. When you return the bow, the deposit will be refunded to you. By using the club bows you will be able to work on developing your form, build your strength all of which will not only give you a better understanding of what you actually need but also potentially mean you can draw heavier bows thus saving you from replacing your equipment too soon. We would normally recommend that a beginner starts with a recurve bow hence this article will focus on that. 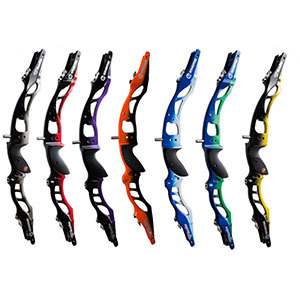 Whilst compound bows are gaining popularity in this country recurve is still the dominant discipline and is potentially cheaper, easier and safer for a beginner to start with. So you've decided, or one of the club coaches has advised you, that it's now time to buy your own bow. What should you buy? This is by no means a definitive guide. 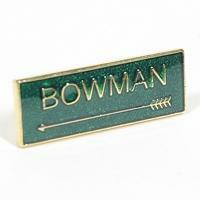 The single most important thing to remember when buying a bow is that it has to be 'right' for you. What is right for you may not be right for someone else and just because a particular bow may not be listed here doesn't mean that you shouldn't buy it. As you will no doubt have seen the price of bows vary widely but keep in mind that, as a beginner, it is likely that you will replace most parts of your bow in the first couple of years depending on how often you shoot and how quickly you pick things up. They come in different sizes, different colours are made by different companies and have different limb fittings. To make life easier for you we would advise that you buy a riser that uses ILF (International Limb Fitting). In theory any ILF limb will fit any ILF riser regardless of make. ILF is by far the most common fitting and gives you maximum choice of limbs. The choice of riser is very much down to feel. A £600 riser won't shoot as well as a £200 riser if it feels uncomfortable to you. Nor is an £600 riser necasarily more acurate than a £200 one. A more expensive riser may however have tuning/adjustment capabilities that the most basic risers don't have but for a beginner such adjustments can cause more confusion than benefit in the early stages. Is one manufacturer better than another? Yes.....and no. The biggest names in recurve bows are probably Hoyt and Win & Win (W&W) but that's not to say that they are the best, at least not at the beginners end of the market. The cheapest W&W riser is more money than a beginner would typically be prepared to pay but that doesn't mean you should rush out and buy a Hoyt either. One particular manufacturer who make some great risers for beginners and intermediates is Sebastian Flute (SF) In some ways these risers are argualbly better than the entry level Hoyt. Other brands that do beginner risers are Cartel and Kap but there are many others. What size should you buy? The size of a recurve bow is determined by the size of the riser and the length of the limbs. The most common size is a 68" bow which typically would mean a 25" riser with medium limbs. However determining what size bow you need is an important step to get right with many variable and so you should really speak to a coach about it or someone at the shop. There is no real way of answering this question. Our advise is that you spend as much as you are prepared to spend but keep in mind that you may still replace it in the first couple of years. The more you spend now the longer you might be able to keep it but far more important than price is how it feels to you. Don't spend £250 on a riser if it feels uncomfortable when a £100 model feels better. Again this is something you will need to speak to a coach about or the shop as they come in different sizes, different weights, made of different materials and made by different companies. The size limb (and therefore the size of riser) you should buy will be determined by your draw length. The average person will shoot a 68" bow meaning that on a 25" riser they need Medium length limbs. Getting the correct bow size is important as if you shoot one that's the wrong size you won't be able to get the most energy from the limbs or you'll be putting too much energy into them. 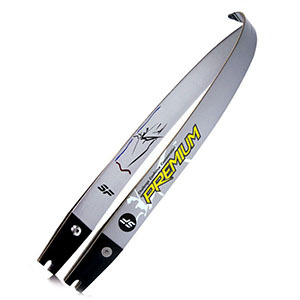 If your draw length is between 27"-29" you will probably need a 68" bow and therefore medium limbs. What poundage should I buy? This is why we suggest using the club bows to begin with. For most people archery uses muscles that they don't use that much in every day life, therefore it takes time to develop them. If you buy limbs that are too heavy you are 'over bowed' and could do yourself an injury and you'll find it very hard to be accurate. If you buy limbs that are too light you are 'under bowed' and won't develop the muscles needed or be able to reach the distances you want. By the time most beginners come to buy their first bow most will be looking to buy limbs between 24lb - 32lb but for some people 24lb will be too much and 32lb too light. Only you know how easy or hard it is to draw so ultimately it's got to be something that you feel comfortable with. What make/model should I buy? Assuming you aren't shooting bare bow, you'll need a sight. There are two schools of thoughts when it comes to buying your first sight and both are equally valid. 1. Buy cheap and replace sooner. 2. Buy more expensive and replace later, if at all. The reason why both are valid can be best demonstrated by highlighting the main disadvantages of both types of sight. 1. They shake themselves loose frequently. 2. They are harder to adjust quickly and finely. 1. They can cost 10x as much as a cheap one. 2. 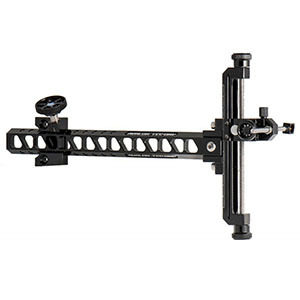 They offer a level of fine adjustment that a beginner won't make use of for several months. To be frank all a beginner needs from a sight to begin with is a fixed reference point. On that basis a pin stuck in some tape on the riser does the job (not recommended long term of course). You do want something though that you can record your sight marks with, but any sight can do that. You can spend a lot more than that the Shibuya Ultima RC Carbon is a whopping £235 but you certainly don't need to spend anywhere near that as a beginner. Arrows are obviously an important piece of equipement that you will need. However it is important to get the right length and spine (thickness/strength) of arrow and that is determined by your bow and draw length. Therefore you should talk to a coach or the shop before making a purchase. 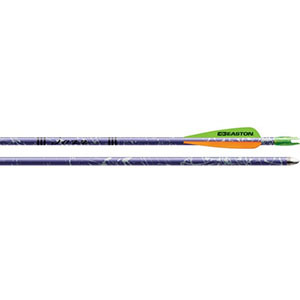 There are dozens of different types of arrows made from a range of materials but as a beginner we would definitely suggest you buy aluminium arrows as these are cheap to replace and perfectly good enough. Typically most shops tend to supply beginners with Easton Jazz or Easton Blues and these are available in sets of 8 or 12 as well as individually. 8 arrows is enough to begin with, you will probably bend and loose some over time but they can be easily replaced. Other equipment you will need will be a tab, arm guard, string, stand and quiver. You may also wish to consider buying a case/rucksack in which to transport and store all your equipment. A Tab is a very personal piece of equipment and often over looked as just a finger protector. Its more than that as it's one of only 2 points of contact you have with your bow. To begin with a tab is just a piece of leather but when you buy your first bow you will probably need something better as the heavier draw weights may hurt your fingers if you shoot with the cheap single layered leather tabs. The most important thing is that you get one that fits correctly. Too small and your fingers won't be protected, too big and the leather will catch on the string spoiling your shot. Speak to the shop to get the right size. Tabs come in all manner of shapes and sizes and prices. You don't need to spend a fortune. What you are getting in the more expensive tabs is a better quality leather which allows the string to slip off more easily, more adjustments and the name. We would advise getting something with a finger spacer to prevent you pinching your arrows off the string but beyond that it's done to personal preference, feel and budget. When it comes to the string just ask the shop to provide you with one but ask them to set the bow up as well. They should then check to make sure that the brace height and nocking point height are correct which may require making some minor adjustments to the string (adding or removing twists). It's a lot easier for you if they do it first but it is something you will need to learn to check and do for yourself as well. Your quiver, stand and arm guard are all just personal preferences. After all that, enjoy your archery! There are many different rounds that can be shot both indoors and outdoors and broadly breakdown to either Metric or Imperial. Imperial rounds are the traditional rounds from Archery GB (governing body of archery in the UK) that are typically named after British cities. These rounds are shot at distances measured in yards. Metric rounds are shot at distances measured in meters and predominantly fall under the World Archery (formally FITA) governing body although there are also some metric rounds from Archery GB. The following tables show the number of arrows (per dozen) shot at each distance for each specific round and the maximum score that can be achieved for that round. The tables also list what size target face is required and the scoring system that is used, either 5 zone or 10 zone. 10 zone scoring is where each of the 10 rings has a different value with 10 being for the inner gold ring, 9 for the outer gold ring all the way down to 1 for the outer white ring. Many target faces number each ring accordingly, as can be seen in the picture above. Indoor rounds such as a Portsmouth are shot in 3 arrow ends with 2 ends (6 arrows) of sighters and use metric scoring. Outdoor rounds such as a York are shot in 6 arrow ends with 1 end (6 arrows) of sighters and use imperial scoring. A 120cm target face is used and rounds involve multiple distances. The furthest distance is shot first and then the bosses are moved to the closer distance. All indoor rounds are shot in 3 arrow ends and archers also get 2 ends (6 arrows) of practice before scoring commences. Archers also have 2 minutes in which to shoot an end an 3 arrows. The metric, 10 zone scoring system is used. A single outdoor round is shot at multiple distances with the furthest distance being shot first. The bosses are then moved closer to shoot the shorter distances. Archers are given 45 minutes of sighters at the furthest distance and the archer can shoot as many arrows as they like within this time. Distances 90, 70 and 60 metres are shot in 6 arrow ends using 120cm faces. The closer distances, 50 and 30 metres, are shot in 3 arrow ends using 80cm faces. For 6 arrow ends the archer is given 4 minutes to shoot, for 3 arrow ends they have 2 minutes. The metric, 10 zone scoring system is used. Archery GB is keen to recognise progress and provides a wide range of awards for all archers regardless of age, ability and bow types. These awards can be a good way of not only charting your own progress but can also motivate you by giving you something to aim for. in the Club Record Book and all shooting is in accordance with the Rules of Shooting. Classifications in archery start with Third Class and continue with Second Class, First Class, Bowman, Master Bowman and Grand Master Bowman. The scores that need to be achieved for each of these classifications are dependent on the round that is shot, the type of bow you use, how old you are and your gender. Details of what rounds can be used for classification and what scores are required can be found here. 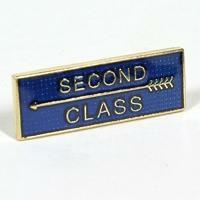 You can claim the relevant badge once you have submitted 3 qualifying scores within the same year. 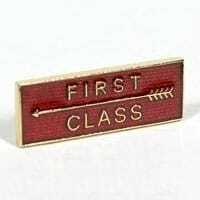 3rd, 2nd, 1st class and Bowman classifications can be achieved by shooting at official club days as well as in open competitions and tournaments and are entirely handled at club level. 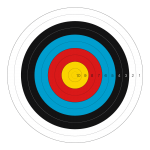 Master Bowman, Junior Master Bowman and Grand Master Bowman can only be achieved by shooting the required scores at UK Record Status tournaments. 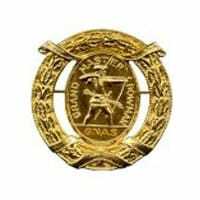 Unlike the lower awards, Master (Junior and Senior) and Grand Master Bowman are co-ordinated by Archery GB and not the club and so all claims are made to Archery GB. 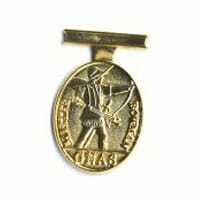 If, at a Registered Tournament or Club Target Day, you shoot six arrows into the gold in one end at either of the two longest distances for your age group (WA Metric or Imperial Rounds), you can claim this badge. Juniors can claim a Six Gold End badge only once in each discipline you shoot - recurve, longbow and compound. There is also a 3 Gold End badge for Longbow. Claims must be submitted to Archery GB on the appropriate form. If it is attained at a tournament then the claim should be ratified by the tournament organiser. If it is attained at a Club Target day, then Club Secretary must sign the claim form. Rose Awards can only be claimed when shooting at UK Record Status York, Hereford and/or Bristol l – V tournaments that have been accorded "Rose Award" Status. Scores required to achieve a Rose Award and the relevant background colour of the badge are detailed in the table opposite. There are many other types of awards available from Arrow Awards for juniors through to WA Target and Star awards that can only be claimed at tournaments with World Record status. For details of these awards please visit the Archery GB website. Whether you are competitive or just shoot for pleasure, shooting in a tournament is a great experience and can be a lot of fun, but it can seem a daunting prospect at first. This guide to what to expect at your first tournament will hopefully help to dispell any fears you may have. The vast majority of tournaments are pretty relaxed events where beginners are very welcome. The only tournaments that are a little bit more formal are ones that have UK or World Record Status and even in these tournaments you will find a mix of elite, intermediate and beginners. All are welcome. Firstly it’s good fun. You get to meet other archers and see different styles & equipment. There are always beginners at comps so you will not be the only one there. You can get a score which can count towards your classification and handicap and then try to improve on it the next time – so it is a great way to see your progress. Our calendar has dates of lots of local and national tournaments and we often email about local tournaments. Arundown runs several annual tournaments and they are only a few miles away in Angmering. We also hold friendly tournaments within the club. Arrive at least 30 mins early so you have time to set up your bow. Who Should You Go With? It is almost always more fun to go with other members of the club – if you are entering a tournament put a message on the forum so other likeminded archers can go with you. You could even share lifts to keep the costs down. Some places are more relaxed than others, but there are a few rules and helpful tips. You can check out the full dress code rules here – but mainly you can’t wear blue denim, olive drab or camouflage clothes or ripped clothes and they shouldn’t have slogans on them. You must bring your Archery GB card (or receipt) to show you have paid your membership. Most venues have a snack stall but it’s always a good idea to take food & drink. A pen to write your scores with! If it’s outdoor, then often a chair and maybe an umbrella or suncream! Your bow & arrows etc and spare equipment in case of damage. On arrival you must register with the organiser who will then tell you which boss you are on. You should then locate that boss and set-up your bow. You will notice that often there will be three lines on the ground. 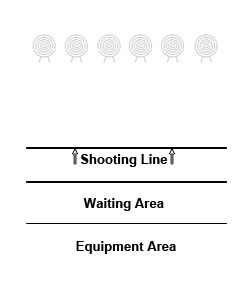 The first line is the Shooting Line. You may only be on this line when it is your turn to shoot. The second line is the Waiting Line. All archers when not on the shooting line must wait behind this line. No equipment other than the equipment you are shooting with can be placed in front of the waiting line. The third line is the Equipment line. All other equipment, bags, cases, coats etc must be stored behind this line. After you have set up and before the tournament starts there will be an Assembly where the judges will tell you the rules and explain the order of events. When the tournament starts there will be one whistle to announce that archers may approach the shooting line. This will be followed shortly by a second whistle to announce that you can start shooting. When everyone has shot (or after 2 minutes if it is a timed round) there will be three whistles to denote that you can score and collect arrows. All arrows must be scored before any arrow is pulled. Do not touch the arrows but instead point to them when calling the scores. Always start at the highest score and work your way out calling them in sets of 3 e.g. “9,7,7” and then “7,5,5”. If the tournament has Record Status or if the judges have told you to do so, mark the arrows on the target face with two short lines either side of the shaft and then pull them out. This is so that if an arrow bounces out the judges can tell where it hit by finding the unmarked hole. If you make a mistake when scoring, simply raise your arm and a judge will come over and make the correction. Do not make the correction yourself. Often there will be so many archers in a tournament that you will need to shoot in details. Typically there would be 4 archers on a boss. Detail A would be archers 1 & 2 and Detail B would be archers 3 & 4. On the first end Detail A would shoot first followed by Detail B and then both details score and collect. On the next end Detail B would shoot first followed by Detail A and so on. Swapping the shooting order means that everyone gets the chance to shoot at a clean target face. If you shoot an arrow and it bounces out of the boss you should continue to shoot your remaining arrows. Then take two steps back and raise your bow above your head to signal the judge who will then tell you what to do. If you or anyone else on your boss shoot an arrow that then falls so that it is hanging in the target face all archers must stop shooting immediately and raise your hand to signal the judge who will then tell you what to do.